Did one of last night’s Nanette Lepore-inspired designs wow you? I take my favorite look of the night off the screen and into your closet so you can steal the look. Austin’s super feminine and girly burgundy trench. The clean lines, luscious color and removable belt screamed girly and fun — something guest judge Nanette Lepore knows all too well. While Austin’s design didn’t quite win, his look was definitely the most wearable out of the bunch. An easy look to recreate! Fashion tip: When finding the perfect trench, the key really is the fit. You want to make sure the coat is not too long and bulky. The most universally flattering style is cut right at the knee. You also want to make sure the trench has a belt because you can tighten it to create a waist, which will instantly make you look slimmer. The bottom line? Trenches are universally flattering, so they’re a must-have in your spring wardrobe. 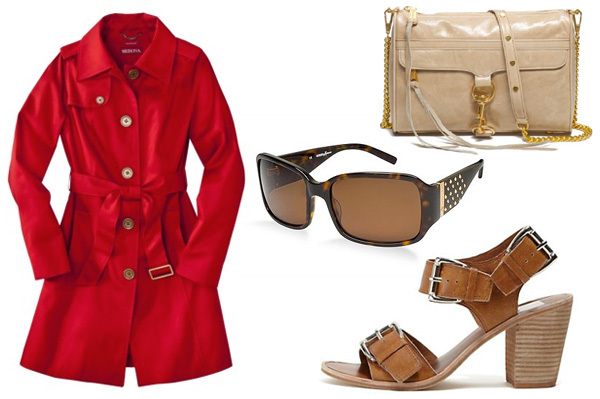 When wearing a colored trench, try pairing with an uber chic neutral wedge or sandal and either a printed skirt or skinny pant underneath. An elegant clutch and “Jackie O” sunglasses will then instantly complete the girly look.